POSTED: Mon, 04/27/2015 - 19:00 | POSTED BY: Traci C.
Book your free dining package now! Guests who book at a Disney Value Resort will receive the Quick Service Dining Plan for free, but can upgrade to the standard Disney Dining Plan by paying the difference in price. Guests booking at a Moderate, Deluxe, or Deluxe Villa Resort will receive a free Disney Dining Plan. At those resorts you can upgrade to the Deluxe Dining Plan by paying the difference. 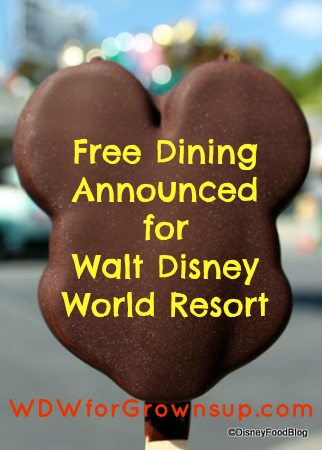 Free dining must be booked by July 10. And don't forget: you must book a minimum of 3 nights and purchase at least a 2-day Magic Your Way ticket with a Park Hopper or a Water Parks and More option. Will you be booking a free dining package this year? Let us know what you think in the comments. Thanks to the Disney Food Blog for use of their photo! What about annual pass holders? Why can't we get this deal? Any idea when the fall room discounts will be published? So what about the people who have already booked and are going within these times surely this should be instantly added to our bookings? We are going in 2016. Any Dates for then? We don't get this deal, but we get to stand in line behind people trying to figure out their points! First week of May come the room discounts. Hi Cathy & JCM - Being a fan run website, and not Disney or a Travel Agency, I don't have any good answers for your questions. We don't like to speculate on upcoming dates, and only publish our stories once Disney has made an official announcement. Tom - That's a great question, some travel agents offer this service, some don't. Please contact the folks you booked your travel through to make any changes.